This is the perfect starter chisel set for anyone looking to create and carve unique figures, objects, reliefs or whatever your imaginations can come up with. 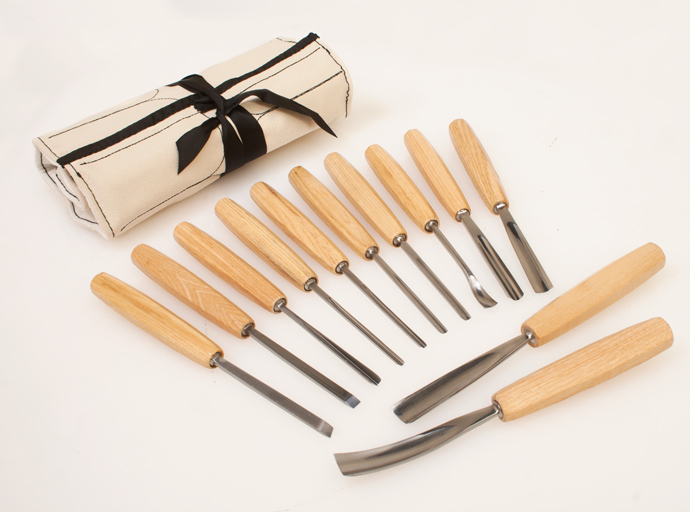 Each chisel has a beech wood handle and is made from high quality steel. 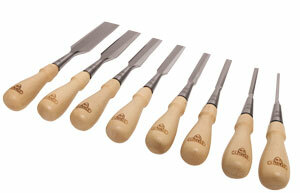 The set includes 12 of the most commonly used chisels types to get you carving right out of the box. Perfect for beginners to experts alike! The overall tool lengths are approximately 9-1/2" to 9-7/8"
The beveled edge 4 pc Chisel Set have handles that are made from impact resistant polypropylene. Each handle is contoured for a comfortable grip and great control. The blades are made from 115CRRV3 tool steel with a hardness of 59-63 RC. The blades are factory ground and should be honed before use. The chisels measure approx. 9-3/4" long and each blade is approximately 3-3/4" long. Each chisel blade is marked with chisel size for easy and quick indenification. 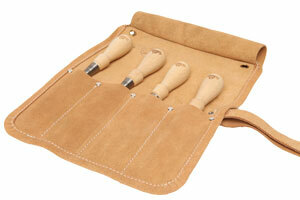 Make clean cut mortises by hand with this complete set of chisels. 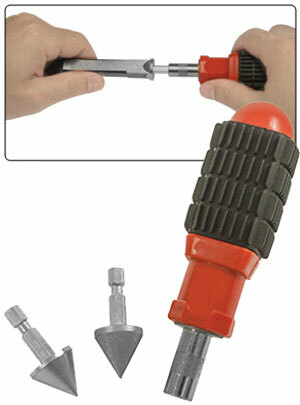 With the threaded chisel handle, this set makes cutting mortises a breeze. Start your mortise by drilling holes with a forstner bit and clean up the corners and sides with the Mortise Chisel Set. Ever try to figure out how to sharpen the inside bevel of your mortise chisels? 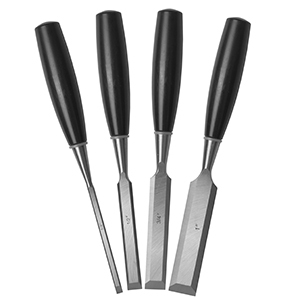 This 3 pc Mortise Chisel Sharpening Set will allow you to quickly sharpen and maintain a perfect edge on all your mortising chisels. Use the 220 grit diamond coated abrasive cone to remove any deep nicks or burrs left behind after honing the out side of your chisels. Next use the 600 grit diamond coated abrasive cone to achieve that clean sharp edge. This set will sharpen mortise chisels up to a 1/2”. This Mortise Sharpening set Includes:1 each comfort grip handle with magnetic quick change chuck, 1 each quick change 220 grit diamond cone (to remove nicks and burrs), 1 each quick change 600 grit diamond cone (to finish the final edge). 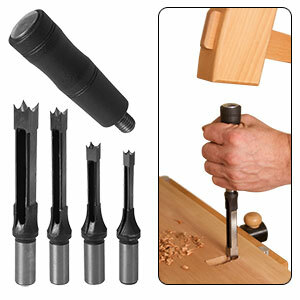 This easy to use spring loaded chisel instantly squares round corners on hinge mortises. Made of hardened steel that stays sharp. Just tap lightly with a hammer for a perfectly squared corner. 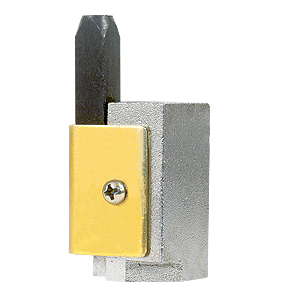 Ideal for squaring corners on hinge mortises and anywhere you need a sharp clean corner. 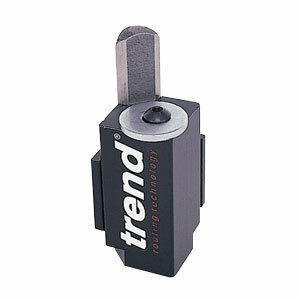 Ideal for squaring hinge recesses in door frames and door edges, as well as lock faceplates. Spring loaded high speed steel (HSS) anvil for a sharp cut and long life. Light weight aluminum body design. Can be used with the Trend Hinge Jig.